NOTE: this example uses Word for demonstration purposes. 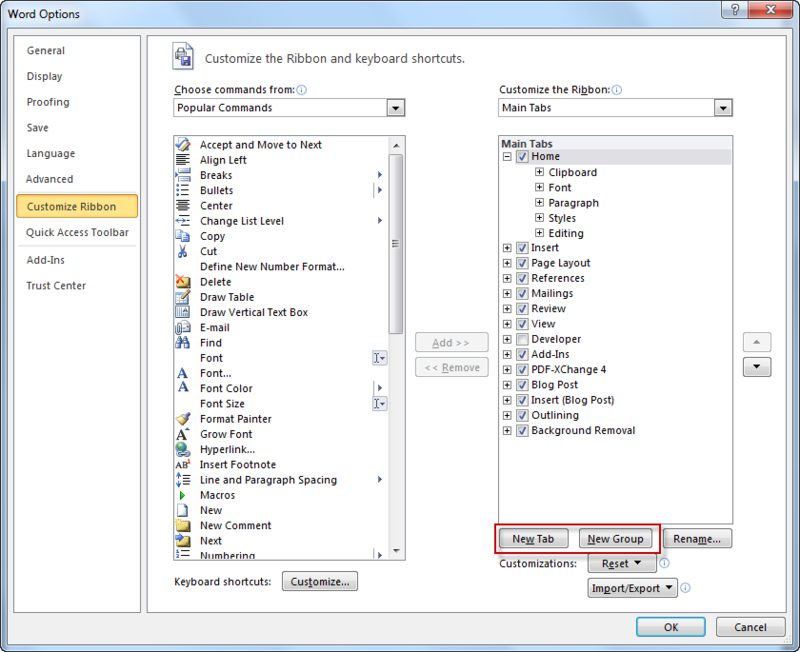 The procedure is similar for the other Office 2010/2013 programs which use the ribbon. Although the procedure is similar, the customization only applies to the Office application in which you are working – Word in our example. 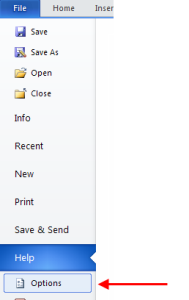 To start the customization click the File tab in Word and then click the Options command as shown below. Notice the two buttons named New Tab and New Group. 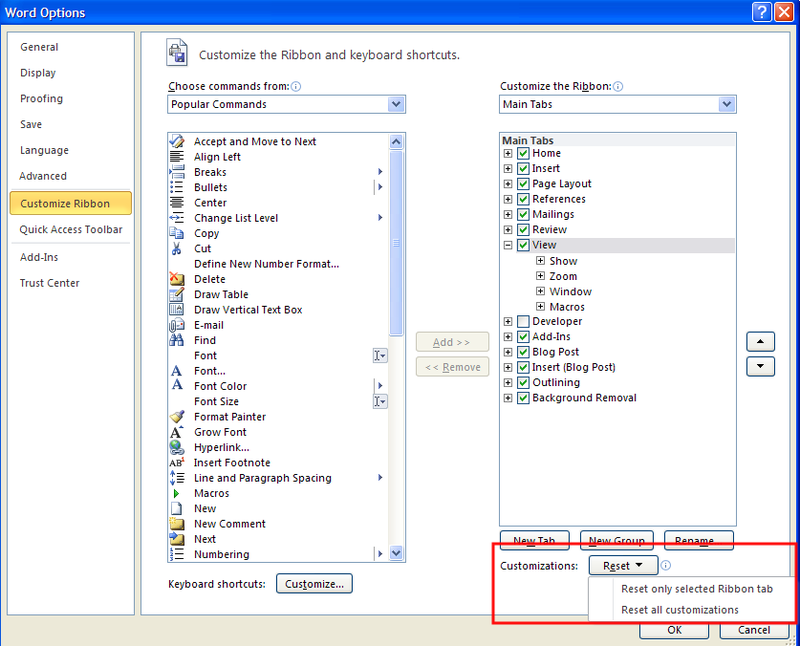 Clicking the New Tab button will result in the creation of an additional tab in the ribbon. 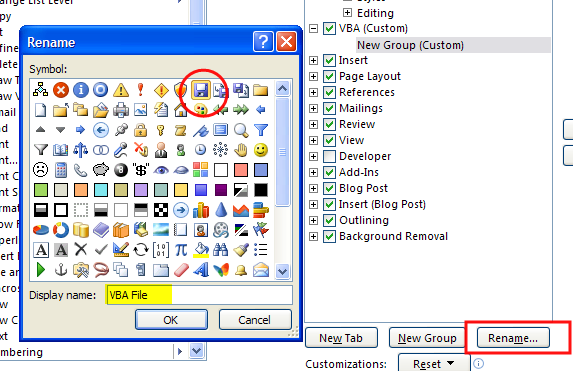 Clicking New Group allows you to add a group of icons to either an existing ribbon tab or a customized tab. 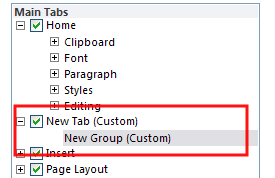 Our example constructs a new tab with three groups. Clicking the New Tab button creates the tab and assigns a default name to it as shown below. A new group, also with a default name, is created since each ribbon tab needs at least one group. 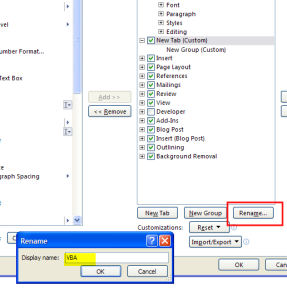 To change the name of the tab or the group, click on it to select it and then click the rename button. Enter the name that you want and click the OK button. The dialog box for renaming a group is slightly different. Selecting an icon for a group name does not do much. However, you can change the icon for any command in your custom group, including the icon for a default command. You can add/rename groups as needed by clicking the New Group button in the dialog box. 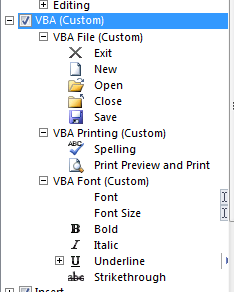 For our demonstration we created the groups VBA File, VBA Printing, VBA Font. To add commands to your groups, find the command in the left-hand listing and click it once to select it. Click the group name in the right hand box once to select it. 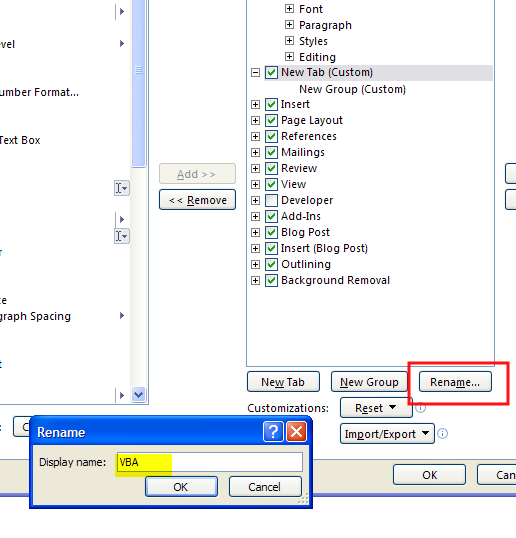 Once the command and group are selected, click the Add >> button to put the command into the group. If you make a mistake, you can click the << Remove button to remove the icon from the group. Continue adding icons to the groups. Our example tab/groups look like the following when we are finished adding commands. After clicking the OK button on the Word Options dialog box your new tab should be displayed as shown in the next screen shot. Other customization tasks include re-ordering groups within a tab, removing groups from tabs, and renaming default tabs and groups. Do not panic if you begin experimenting and find that you have ‘inadvertently’ turned the application’s ribbon to trash. 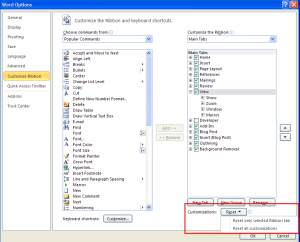 You can correct your mistakes by clicking the Reset button on the Word options dialog box. You can either reset the selected ribbon tab or all of your customizations. Reseting all customizations also removes any customizations that you did to the quick access toolbar.